After months of speculation, we now have confirmation on the gameplay mechanics for the Prison of Elders activity in the House of Wolves. Bungie's live stream introduced us to the survival game mode and revealed many details about the new end game activity including modifiers, the new cannon weapon and different weekly challenges available. First a look at the basics of PoE. 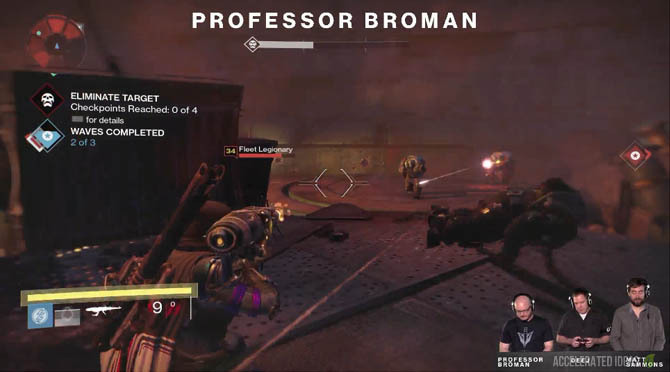 Prison of Elders is a round based, 3 player activity, similar in many ways to a raid. 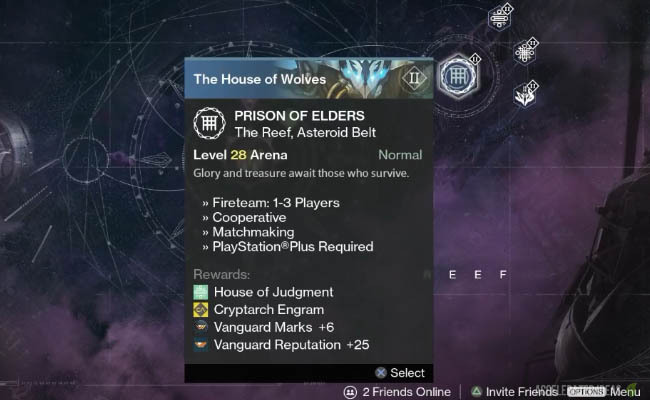 Upon visiting the Reef (and completing the story missions) players can select from one of four available Prison of Elders challenges. The first challenge (the larger circle) is a level 28 activity which includes built in matchmaking. This activity can be played many times a week but the rewards from the activity are limited compared to the higher levels. You'll earn a small amount of reputation, marks and also the new House of Judgement reputation for completing the challenge. The additional three challenges are spread across higher levels: 32, 34 and 35. None of these playlists have matchmaking so players have to rely on Reddits Fireteams or DestinyLFG. Of course the level 35 challenge is one level above the maximum Light Level for the House of Wolves. This puts players in a similar position to the Hard mode for Crota where enemies absorbed and dealt a huge amount of damage. The Level 32 and 34 challenges are rotated on weekly reset (Tuesday) and there's a total of five different challenges, which the game randomly selects each week. This is similar to the weekly nightfall which changes every week. However, unlike the level 28 activity, the high level challenges can only be completed once a week because of the high rewards. The Level 35 challenge is fixed and does not rotate with the rest. You'll earn varying amounts of House of Judgement reputation for completing the high level challenges: 200 rep for Level 32, 300 for Level 34 and 500 for Level 35. Increasing your rank will open up the opportunity to buy armour and weapons from the Vendor using your Core's. Level 32 Arena - "Valus Trau'ug seeks to prove his might by crushing all who challenge him". In the fourth round of this playlist you'll encounter the Wretched Knight, a mini-boss straight from the Hive collection. He's not that hard to defeat but that's just the start because the final boss is Valus Trau'ug who appears in round 5. He's a huge cabal Centurion who regenerates health automatically and also has a shield which cycles through the different damage types: solar, void and arc. To defeat Valus Trau'ug you'll need a good selection of varying weapon types in your fireteam. Level 34 Arena - "The Flame Prince Urrox vows to burn the Light until all that remains is Darkness and bone". Level 35 Arena - "Skolas and his crew challenge the Guardians who captured him. Face him with a Fireteam for three. End him". As you can see from the list above, Armor Core will drop at Level 32 and 35, whilst the Weapon Core will drop from Level 34 and 35. That's a good balance because it gives you the chance to earn new armour at the current Dark Below level (32). 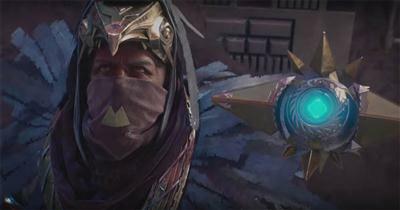 Similar to Weapon Core, Etheric Light will only drop at level 34 or higher. This material is required to push your old/current weapons and armour to the new higher stats. Upon entering the Prison, you'll be instructed to enter one of the cells. At this point the modifier is displayed on screen, which significantly changes gameplay. A good example is the primary weapon buff where primary weapons become stronger for the duration of the Round. For every Round, there are a number of waves, usually three. Completing all waves (without dying) will complete the Round. At this point you're instructed to return to the starting area of the Prison where further instructions are given and you enter one of the other doors to start another Round. The new relic like weapon for the Prison of Elders is called the Scorch Cannon. It's a huge bazooka weapon which fires rockets that stick to surfaces or enemies before exploding, causing massive damage. The weapon comes pre-equipped with several rockets and it doesn't need to be reloaded. There are eight modifiers in the Prison of Elders. These modifiers are shown briefly before a new round and they stay active until the round is completed or Guardians wipe and restart. Small arms - increases primary weapon damage output. Exposure - increases your shield but doesn't allow your shield to regenerate again. Your health (final third of the bar) can regenerate though. Brawler - the guardian version of Lightswitch which triples your melee attack damage. Catapult - decreases the grenade cool down time. Trickle - increases the cool down of all your abilities (grenade, melee special and super). Several mines will be hovering around the cell area. Players must stand within the mines radius to slowly diffuse the mine, much like a capture the flag mode. All mines need to be diffused to complete the wave. Defeat the BOSS for this round which is a high level (major/ultra). The game displays a number of checkpoints which relate directly to the boss's health bar.